Many individuals with Down syndrome struggle to speak, stutter/stammer and are partially or wholly unintelligible to listeners. They are often frustrated and embarrassed by their difficulties in communicating thoughts and ideas. Some will keep trying to get their message across, some will rely on others to clarify for them and a few will withdraw, possibly giving up talking altogether. Parents end up interpreting for their children and professionals are insecure about how best to be of help. 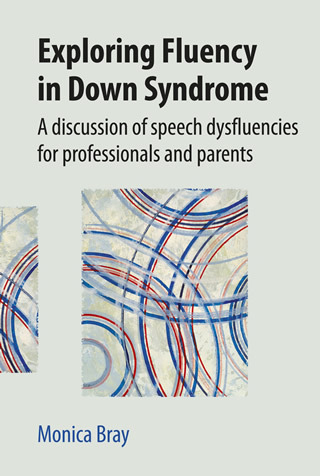 This book explores the 'hows' and 'whys' of dysfluent speech in those with Down syndrome, using real-life spoken language examples as well as presenting literature in the areas of language, speech, prosody and fluency and mapping this information onto what is known about Down syndrome. The backbone of the book is the interaction with parents, people with Down syndrome and professionals on what it is like to live or work with these problems as well as what is helpful and unhelpful in trying to overcome them. ...this book is hugely useful...whether you are new to the topic or have years of experience [it] will add to your knowledge and shape your thinking. Read the The British Stammering Association review. Reproduced with permission of The British Stammering Association. Free download of sound files to accompany the book available here. Monica Bray is Associate Lecturer at Leeds Metropolitan University, and a Consultant Speech and Language Therapist for the Education Centre for Children with Down Syndrome.